How's the Andersonville and Edgewater Housing Market? HOW’S THE ANDERSONVILLE AND EDGEWATER HOUSING MARKET? We are seeing a brisk market, especially for condos with two bedrooms. Buyers are purchasing well-appointed two bedroom condos within 10 days of going on market. In February and March of 2013, the Move with Maggie Team listed six condos for sale in the area, and sold (went under contract) in an average of 10 days or less. Four of the six had multiple offers and they sold on average for 98% of list price at time of offer. We are seeing buyers willing to pay very good prices for well-appointed condos. However, condos that are not staged or well-appointed tend to sit on the market for longer periods of time. Condos without some sort of deck, patio or balcony, or without parking (not even rental parking), are sitting for longer periods of time or in some cases needing price reductions in order to sell. Our one bedroom condo market has not bounced back as quickly, most likely because given our low interest rates hovering around 3.75%, buyers can purchase a two bedroom for what they would have paid for a one bedroom. Andersonville continues to be a popular destination for professionals, boomers, and retirees seeking housing in Chicago. 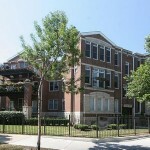 Be sure to check out movewithmaggie.com for recent sales and property that is available.